Home / Debt / Should You Pay Off Your Student Loans Early? With more than $1 trillion outstanding in student debt (some of it mine! ), it’s no surprise that many college grads and others are trying to figure out how to repay their loans. For those with jobs that allow it, the next question is whether or not it makes sense to pay off student loans early. If you have student loans, carefully consider your own situation, as well as the general pros and cons associated with repaying your student debt early. The first consideration is how much you could save. By putting extra money toward your student loans each month, you can pay them off earlier, and save money in interest. Cutting the term of your loan in half can save you thousands of dollars in interest. That’s a strong argument in favor of paying off your student loans as early as possible. However, before you tackle your student loan debt, it’s a good idea to look at other types of debt. If you are paying 13% interest on credit card debt, it makes more financial sense to pay off that debt first, before attacking your student loan with 7% interest. 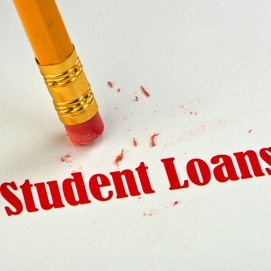 Make sure that any student loan pay-down plan takes into account your other debts. Your student loan debt reduction should be coordinated with the rest of your debt pay-down plan. If you have a student loan that has a higher interest rate, of between 6% and 12%, it does make sense to pay it off early. However, my student loans were consolidated back in 2005. Not only were interest rates on student loans much lower then, but my servicer knocked down my rate when I signed up for automatic payments, and dropped it again after I made 36 on-time payments. As a result, my rate is locked in at less than 2%. Even counting inflation and taxes, my investment portfolio is doing better than that. Instead of putting extra money toward paying down the student debt, I’ve increased my retirement account contributions. Over time, putting that money toward investing makes more financial sense than paying off my student debt early. Another consideration is the fact that I also get a tax deduction for the interest I pay on my student loan. With higher-rate student loans, that tax deduction isn’t really worth it, unless you use it to your advantage while you pay off other, higher-rate debt. In my situation, paying off the student loans isn’t a priority because of the low rate and the tax deduction. I have other things to do with the money. Of course, there is no price that can be put on peace of mind. Even with the financial advantages I see to not rushing to pay off my student loan debt, others couldn’t live with it hanging over them. Instead, they would feel better with the idea of being completely debt free. And there are risks to keeping the student loans around. My income situation could change, and then I wouldn’t be able to make payments. However, I have emergency-type funds, and with federal student loans, it’s a little easier to get a deferment than it is for other types of debt. In the end, you need to look at your situation and decide what works best for you – what you are most likely to be comfortable with. Paying off your student loans early is a big decision, and it is one that you should carefully consider. How about you? Are you going to pay off your student loans early? Leave a comment! 2 Responses to Should You Pay Off Your Student Loans Early? I paid off my student loans early. I wanted the peace of mind, and most of my loans also had high interest rates (6% and above), so I wanted them gone.